Vortex's Diamondback scopes are loaded with features that put them in a class of their own! Single piece aircraft grade aluminum construction, full weatherproofing and fully multi-coated optics keep your scope functioning and your aim on target independent of what mother nature is doing. Get a Diamondback and get a scope for life. Vortex&apos;s Diamondback scopes are loaded with features that put them in a class of their own! Single piece aircraft grade aluminum construction, full weatherproofing and fully multi-coated optics keep your scope functioning and your aim on target independent of what mother nature is doing. Get a Diamondback and get a scope for life. 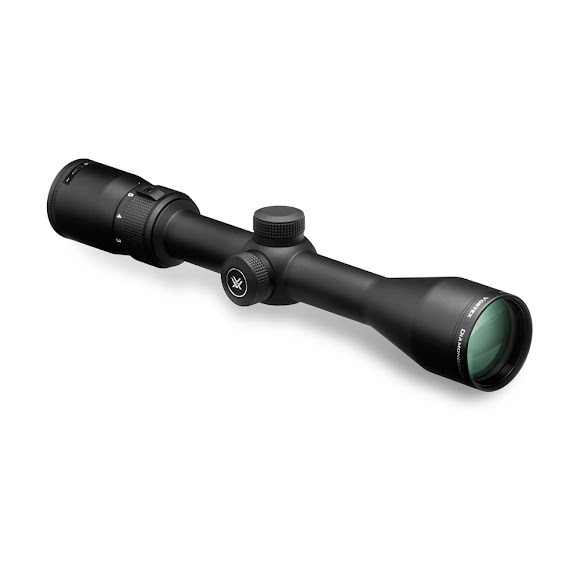 The 3-9x40 riflescope is ideal for big game, predator/varmint, muzzleloader, slug shotgun, and long range applications. A popular all-purpose hunting reticle intended for a wide variety of hunting applications. Standard tube diameter for most American riflescopes. Premium grade of aluminum, valued for fatigue resistance. Uses premium components in the zoom lens mechanism, ensuring smooth magnification changes under the harshest conditions. Allows quick and easy reticle focusing. Are less susceptible to accidental impact damage. Allow re-indexing of the turret housing to zero after sighting in the riflescope, generally requires use of a coin or wrench. Optics are sealed with o-rings to prevent moisture, dust, and debris from getting inside the scope. Lenses are locked in place, fore and aft, with machined locking rings to remain in perfect alignment and withstand recoil and impact. Hard-coat anodization is durable; the low-glare matte helps camouflage the shooter&apos;s position.